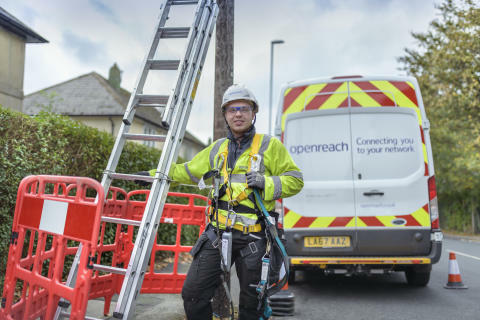 At Openreach our plan is to deliver better service, broader coverage and faster speeds for everybody. Not just for those that live in our towns and cities but also for those that live in the more rural parts of the country. That is why we’re delighted to be working once again with the Welsh Government in widening access to fibre broadband across Wales. Previously we teamed up with the Welsh Government to successfully deliver Superfast Cymru. Our engineers delivered an enormous engineering project that was recognised as one of the outstanding digital network roll-outs in Europe. As a result of that work Wales now has better fibre broadband coverage than France, Germany or Italy and nearly 95 per cent of Welsh homes and businesses across the country can access superfast broadband today. But we also appreciate that there are those that didn’t benefit and this latest intervention working alongside the Welsh Government will be one part of a suite of measures to bring faster broadband to those that missed out during Superfast Cymru. Given their location and the surrounding topography we already know that the vast majority of properties will be connected using a method where fibre is run direct from the exchange to the property. A process known as ‘Fibre to the premise’ or ‘FTTP’ for short that brings with it access to speeds of up to 1Gbps - some of the very fastest speeds available across Europe. FTTP provides additional capacity for data-hungry services and applications, such as Virtual Reality gaming and smart homes, where a network of online sensors can coordinate and control home appliances – from thermostats, door bells and security cameras to door locks, lawn sprinklers and washing machines. It’s worth noting that Wales already has the largest rural FTTP footprint in the UK. This will go some way to further expanding that network. We’ve been busily recruiting more than 250 engineers across the country this year to further strengthen our workforce to help expand the network. We’ve also signed a new deal with key landowners in Wales - the Country Landowners Association and the National Farmers Union. This will make getting wayleaves sorted much easier and more quickly which is great news for us as we move forward with extending our network. We’re under no illusions that this will be an easy challenge but as a business we don’t shy away from the difficult. A large number of the remaining properties are rural and isolated. Getting to them will be tough but I know that our engineers – as we saw during Superfast Cymru – will come up with brilliant solutions to complex engineering challenges that will bring high speed broadband to even more communities across Wales.